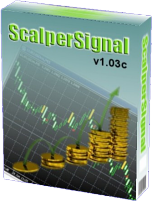 The ScalperSignal indicator (ver. 1.04) is a visual way to help determine whether to buy or sell against a pivot level (it does not repaint). The painted bars mark a “pivot high” or “pivot low.” This is done after 3 higher closes or 3 lower closes. The faster the time frame, the faster the confirmation. Red arrows below the bar mark a continuing downtrend confirmation while the Green arrow above the bar marks a continuing uptrend confirmation. The indicator measures price action when you trade. It is mainly used for trading stocks and futures, but it can also be used for currency crosses. Investments in commodity contracts such as Forex involve a high degree of risk to your money. Before investing in such markets you should be well aware of the risks involved due to the fluctuation in the value of such commodities’ prices, which can cause fluctuations in the value of your investment. You should therefore not invest in this market if you do not have adequate experience. You are also advised not to invest funds that you can not afford to lose. The author of this page and its contents is not responsible for any loses, misunderstandings, omissions or missing information of any kind. All investors are advised to build their understanding of the Forex market from various sources before making any investment decisions. This is neither a solicitation nor an offer to Buy/Sell currencies, futures, stocks or options on the same. No representation is being made that any account will or is likely to achieve profits or losses similar to those written on www.the-forex-strategy.com and www.az-invest.eu. The past performance of any trading system or methodology is not necessarily indicative of future results. No guarantee is made that you will be able to replicate the same results.